A nationwide survey of 2,000 mums and dads found they have a very clear idea of when their children should have achieved, or be allowed to, do particular things. 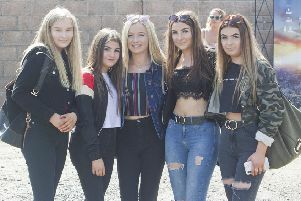 They believe their little ones should begin to get pocket money at nine, start putting their own clothes in the wash at eight and be old enough to have Facebook at 14. Youngsters are considered mature enough to walk to school alone and have their own mobile phone at 12 years of age. Teaching children the value of belongings and how to avoid loss are among the things that cause mums and dads the most problems as their youngsters get older. Commissioned by My Nametags, manufacturer of durable sticker and iron-on labels, the research of parents with kids aged two to 18 also found 70 per cent believe privileges are granted too soon nowadays. Lars B. Andersen, Managing Director at My Nametags, said: “The survey just goes to show some of the many intricacies of being a parent. “Of course, every child is different and may be able to do things or take on certain responsibilities later or earlier than our results show. Mums and dads will let their kids watch 12 certificate movies alone at 12 years old, 15 certificate movies at 14 and 18 certificate movies aged 16. Once they reach 16 they can have friends over when mum and dad aren’t around and also be out after dark. While 15 is the age they can listen to explicit songs, go on dates and start buying their own clothes. Parents are happy for their youngsters to have a TV in their bedroom at 11 years old and trust them to surf the web unsupervised when they are 12. WhatsApp and Snapchat accounts are permitted at 14, while MP3 players and tablets are allowed at 12 – and laptops are considered acceptable at 13. Ten is the age they can have friends over for sleepovers and go to their pals for overnight stays too. And 13 is the point when parents trust their children to be in the house alone and also go out on their own. Those polled believe children can stay up until 8pm at eight years old, not go to bed until 9pm aged ten and not get their heads down until 10pm aged 12. Twenty-nine per cent of mums and dads consider themselves to be stricter than other parents. However, 56 per cent said they granted many of the privileges featured in the research earlier than they were granted them by their own mums and dads. Four in ten said they feel peer pressure from other parents to allow their kids to do certain things, while half have fallen out with their partner over certain privileges. Lars B. Andersen, Managing Director at My Nametags, said: “It’s also really interesting to find that a parent’s biggest worry is their child losing something, especially as we don’t expect children to be responsible for their possessions until the age of ten – which is halfway through primary school.